Annotation: In a world where women are created to serve at the pleasure of men, sixteen year old freida must decide what is worth fighting for – her best friend or her future? Plot Summary: Baby girls are being no longer born naturally. So eves were created – bred and educated in schools until their sixteenth birthday where they are chosen for one of three paths, companions, concubines or chastities. In this world, eves are ranked weekly by their beauty, eating disorders are encouraged, and obedience is paramount. In this world, isabel and frieda have grow up best friends sure of their future as companions – as befitting two of the most highly ranked students of their year. However, as senior year starts isabel starts drifting away and gaining weight risking her future. Bewildered by her friend’s change, frieda must make choices for her future – even if it means betraying her only friend. 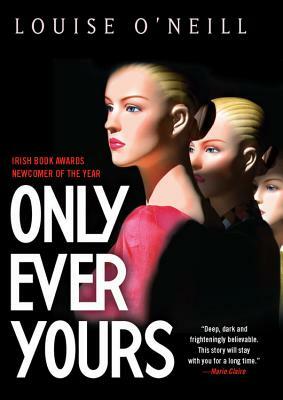 Critical Evaluation: First published in the UK, O’Neill’s debut has been making waves including winning the 1st YA Book First – a recent award created for UK and Irish YA books. Finely crafted, Only Ever Yours is set in a dystopian future where it feels painfully real. By keeping the setting of the story in The School, the attitudes, judgements, expectations, and beliefs espoused in the story feel like any potential middle/high school in today’s world. The constant pushing from the school to be pretty, thin, perfect, and the right pick for a man. The continual competition to be placed at the top because there are only oh so many spots as companions. The continuous loops of subliming message like “I am a good girl. I am appealing to others. I am always agreeable.” or “emotional behaviour can be off-putting to men”. It is in this environment that we see a young girl fall apart and spiral out of control and at the center of it is her relationship with her only friend, isabel, which seems to have deteriorated as isabel’s behavior changes suddenly from top girl to gaining weight. This is not a happy or hopeful story, but one that will spark conversation on how we view modern society and women’s roles in it. A clever feminist satire. Challenge Issues: If this were challenged, I would mention that Only Ever Yours YA Book Prize winner and has this said about it: “Only Ever Yours is as far as I’m concerned not just a worthy winner of the prize but one of the best speculative fiction books I’ve read in years. It pushes the boundaries of contemporary YA. I’ll be pressing it into the hands of anyone who might read it.” from Rick O’Shea, a YA Book Prize judge and broadcaster at RTE. In addition, I would mention the positive reviews from from Publisher’s Weekly and The Guardian. Finally, I would point them to an article by the author on why she wrote this book.